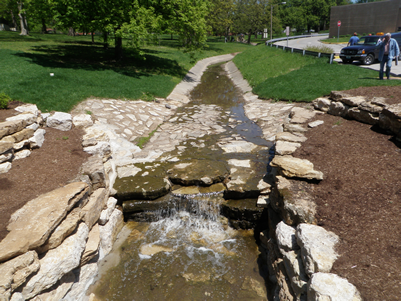 The Kirkwood Park - Walker Lake Phase 4 Project was the final project in the Kirkwood Park Masterplan. 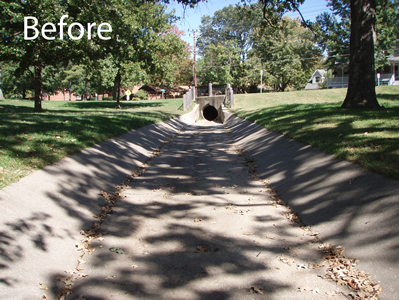 The intent of the project was to remove the existing concrete channel and replace it with a visually appealing, natural channel, while preserving the existing mature trees. 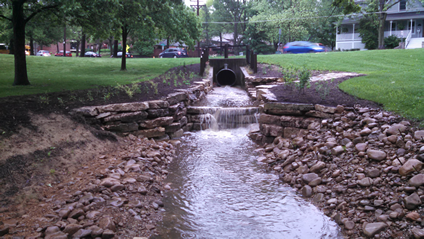 The existing channel is over 500 feet long, with a steep bed slope and a contributing watershed of 87 acres. 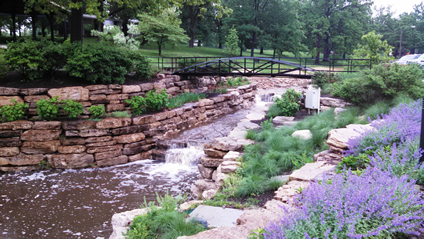 Intuition & Logic was the project civil engineer teamed with Planning Design Studio Landscape Architects and tasked with design of the channel and permitting. The design consisted of removing the trapezoidal channel and replacing with a two-stage natural channel. 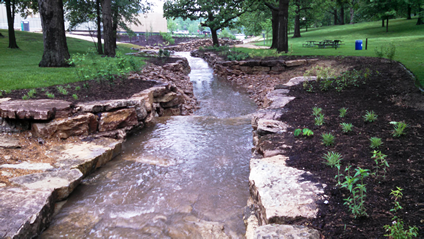 The low flow channel used decorative round river rock and connected to vegetated flood benches. Where the channel closely abutted existing trees, ledgerock retaining walls, bed armoring and grade control drop structures were used to control and dissipate the excessive stream energy. Our services continued through construction providing construction observation services, shop drawing reviews and change orders. Near the end of construction, the project was tested by Tropical Storm Bill and performed very well. In July 2015, the Comprehensive Master Plan, covering all of the constructed phases, was presented at the Shaw Nature Reserve annual training workshop for architects, engineers, biologists, contractors and other professionals. Tim Dean served as one of the three presenters and discussion panelists for the event.